Bates Canyon Road on the west side of SR-36 is being redesigned to add space for motorists traveling the road. This view shows the close proximity of utility poles that will be moved as part of the project. Drivers perplexed by the narrow lanes and skewed alignment of Bates Canyon Road west of state Route 36 headed toward Cambridge Way will get relief. 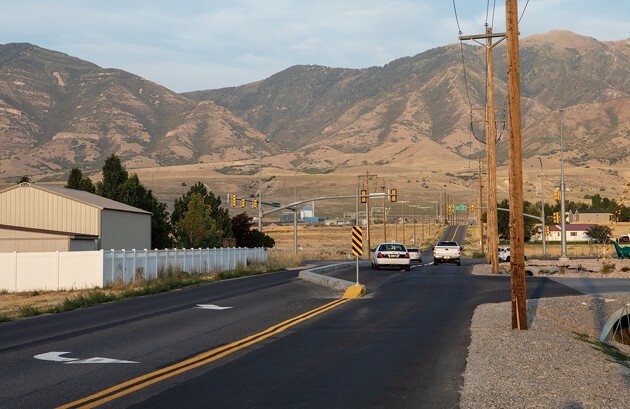 Tooele County has started the design process for widening and realigning the segment of Bates Canyon Road that runs in front of the new Holiday Oil convenience store. 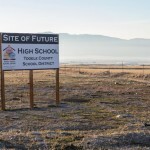 Construction should be completed by the end of the year, according to Tooele County Commissioner Myron Bateman. Currently there is a diagonal line in the eastbound lane of Bates Canyon Road as it goes through the intersection of Bates Canyon Road and Cambridge Way. The line directs traffic to the south side of the concrete median and diverts traffic from the west bound left turn lane on Bates Canyon Road. On the north side of Bates Canyon Road a storm drain pipe will be placed inside an existing culvert, which will allow the road to be widened and curb and gutter installed. The eastbound lane of Bates Canyon Road will remain one lane wide, but the widening should make the turn from SR-36 easier, according to Bateman. On the south side of Bates Canyon Road a storm drain pipe will also be put down and curb and gutter installed. The existing left turn lane for access to SR-36 will remain and the lane for straight through and right turn traffic will be widened. A left turn lane will also be added from Bates Canyon Road onto Cambridge Way. There is no sidewalk in the plans between Cambridge Way and SR-36, but the county does plan a crushed lime fines path on the south side of Bates Canyon Road heading east. Future development on the north side of Bates Canyon Road will include sidewalks running toward Stansbury High School, Bateman said. Construction on the north side of Bates Canyon Road to Cambridge Way may begin as soon as plans are completed and a contract is awarded to a successful bidder, Bateman said. The start of construction on the south side will depend on when Rocky Mountain Power moves power poles that are in the way of the widening project, he said. 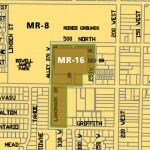 The county will pay for the construction project. An accurate estimate of the cost will not be available until the design work is completed, Bateman said. I hope this project doesn’t end up like Village Blvd. a total disaster taking way to long to complete.